Garden Photo of the Day: When is a flower too big? When is a flower too big? My uncle Calton always seemed larger than life. A tall man, though not portly, he had a great booming voice that filled a room. His cackling laugh was infectious, and he was a great jokester. Married to my mother's older sister, he once pulled a prank on my grandmother. Every morning she would go out to gather eggs in the hen house. One day, she discovered an inscription on one of the eggs: "Prepare to meet thy God." Word spread quickly throughout the countryside about this warning from above. The egg was placed on a pillow, and people from far and wide came to the house to file by the portentous sign. I can't remember the end of the story, and everyone who told it is gone. It could be that many people never knew the truth behind the egg doctored by Uncle Calton. I don't think anyone ever told my grandmother. Another bigger than life fact about Uncle Calton was that he grew dinnerplate size dahlias. I remember pulling up to their house and seeing tall staked plants lined up like soldiers, each with its large flat head staring down at the ground. The flowers were huge and gaudy, but at the same time fascinating. Keeping with the larger than life theme, Uncle Calton claimed the secret to the size of his flowers was elephant manure. To the great embarrassment of his children, he would boast about his stockpiles of manure, gathered when the circus was in town. All this long detour to say that I was reminded of Uncle Calton's dahlias when I took this picture of my friend Tutta Glass. 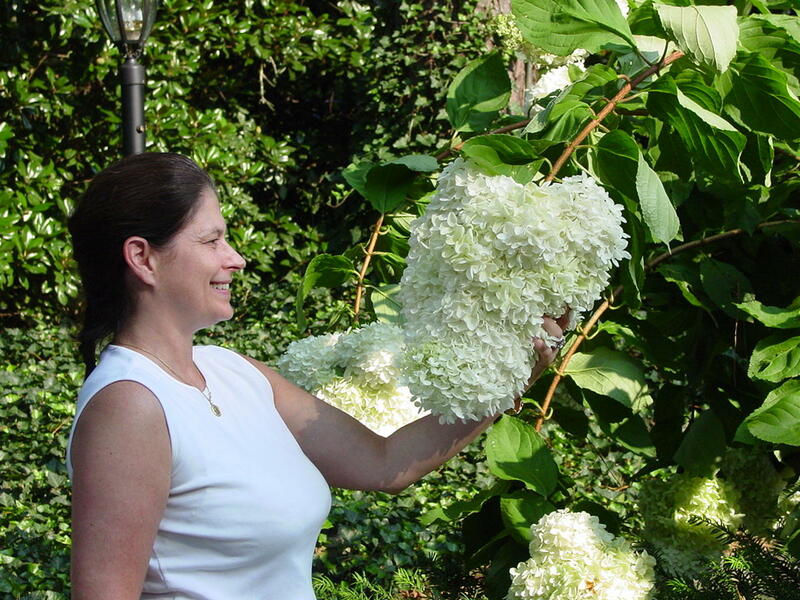 Hydrangea paniculata 'Grandiflora' is the largest of the paniculatas that bloom in August. The flowers grow even larger if the bush is pruned in late winter. You can see that the bloom weighs the stem down (this particular plant was one of two trained into standards), making for an odd looking spectacle. I do love these summer flowers, and now there are some cultivars in between the species, which I think is too small to be effective and doesn't have a nice habit, and this large cultivar 'Grandiflora,' which can grow to ten feet. 'Limelight' has flowers that are somewhat smaller, but still pretty large. 'Little Lamb' is a more compact plant. I'm trying out 'Silver Dollar', which so far is my favorite of the paniculatas. It's sort of the "just right" size of the ones I've seen so far. Like 'Limelight', it's supposed to turn pink in the fall. Right now, I'm seeing a brown petal or two, so the jury is still out. Still, the white blooms tinted with chartreuse are beautiful next to a container overflowing with dark purple, velvety petunias - a combination I want to remember and try again next summer.